In a small town in Delaware, Polly is having a drink at a bar when Adam walks in and takes notice. She’s gorgeous and he’s handsome; a spark of mutual attraction. They each tell the other that they’re just passing through with no intention of putting down roots. However, plans are abandoned when the two become romantically entwined. As the summer rolls on and secrets come to light, can either Polly or Adam truly come clean with one another before death arrives on their doorstep? In the style of James M. Cain’s influential novel, The Postman Always Rings Twice (“they threw me off the hay truck about noon”), the reader is thrust into the story with limited knowledge about the characters. Lippman holds her cards close to her chest, choosing to leave her audience in the dark for as long as possible. She slyly lets out bits of backstory, but holds back enough to drive you crazy trying to put together the missing pieces. I loved the characters in this story. Lippman manipulated me so many times that I felt like I was losing my own sense of judgement. Just when I would develop an opinion on a character, Lippman would show me something from their past that would completely change everything. That’s all well and good in storytelling, but the important thing is that their histories are plausible based on who they are now; that it’s not misdirection for the sake of misdirection. It didn’t take long before I could no longer take these layered characters at face value. 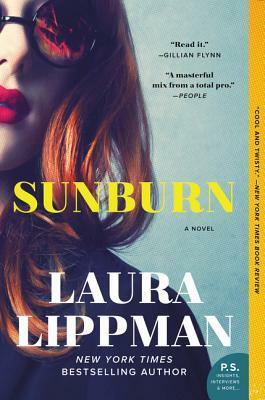 With Sunburn, Laura Lippman has written a sizzling page-turner in the style of a classic noir. A novel as salacious as it is mysterious, readers will find themselves devouring chapters in single sittings as they race to the end. I can see now why authors and fans alike were buzzing about this book way back at last year’s Bouchercon.